I have a ubiquitously discussed fascination with shots at the rim. I want to know how teams make them and how teams stop them. A week ago, in the midst of fan euphoria with the Wildcats in the Bay, I went in on Stanford’s #TreeDunk. The silly video lauded the Cardinal as dunking all over Wildcats. I took to the numbers and found that they actually spend very little time at the rim and that’s fine. 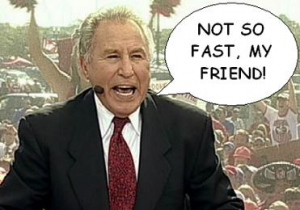 What I neglected to address – and I had no qualms about it then – is rim defense. So this week I will. Defenses are constructed in many ways with lots of different philosophies on how they’re going to keep you from scoring. We can look at UCLA for example. Here’s a team playing significant amounts of zone this season, packing into the lane to compensate for size and athleticism issues. They’re effectively defending by forcing teams to shoot threes. Against the Bruins, 42.3% of shots are from distance (that’s 7th most in the nation). Conversely, Sean Miller’s pack line defense is engineered to limit threes, allowing just 26.9% of shots from deep (23rd lowest in the nation). But forget about three point defense. You can read about it here and learn a lot. Perhaps not-surprisingly, this chart demonstrates that some of the more front court adept teams do a better job of blocking shots at the rim. This makes sense as Washington is devoid a significant post presence whereas teams like ASU, OSU, and USC have some significant size down low (you realize Omar Oraby is 7’2″). This further suggests that perhaps Washington’s rim defense is not predicated on shot blocking (though to say anything of Washington’s defense this season is a leap). Size doesn’t necessarily matter when it comes to shot blocking, but it can’t hurt. Leading the way here is USC. The same team we previously saw sitting in eighth place in block percentage and third in block percentage at the rim. Meanwhile, Colorado is in second with just the seventh best block percentage overall and at the rim. Next is Cal who ranked sixth in both block percentages and, in some regard, we’re starting to see an inverse relationship. I don’t believe this to be statistically relevant but I do think that this is an indicator that just because you’re blocking shots, doesn’t mean people aren’t making other attempts. 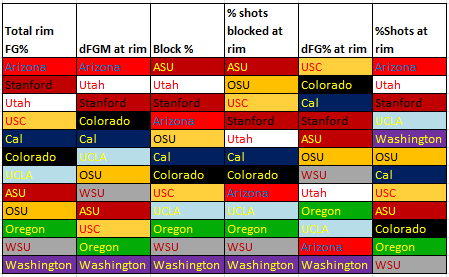 Our presumed block leaders, ASU and Utah, are in the middle of the pack, yielding pretty average FG percentages. Washington sits at the bottom of both lists and I’m willing to leave that discussion there. The interesting fact here is that Arizona – they of the nation’s top defense – allow teams to shoot a gaudy 65.6% at the rim (316th nationally). The average team shoots 60.9%. It would seem the Wildcats are amongst the worst rim defenders in the country. HOLY PACK LINE DEFENSE the Wildcats don’t let anyone get near the iron! That percentage leads the nation and handily leads the conference. But with regards to whether or not they defend the rim well, can we simply anoint them the Sworn Brother’s of the Rim’s Watch? Probably, but I’m not entirely satisfied. What do we know about Stanford’s rim protection – the team I dogged for not taking shots at the rim and who led this article? They allow 32% of shots up close while the average team is taking 38.3%. Not too shabby while also ranking fourth in dFG% at the rim. Meanwhile, Colorado ranks near the bottom of the twelve at 36.7% of shots at the rim, flirting with average. However, they nearly lead the conference in dFG% against. Are you seeing a pattern? I’m not. By finding the ratio of rim makes to total field goal attempts on defense, I believe we’re looking at the defense as a collective. After all, the goal of a defense is to prevent the other team from scoring and the other team scores by taking shots. That’s what is represented in the denominator. The numerator in this case (field goals made at the rim) represents the number of easy buckets yielded. In short: As a fraction of total defense, how much are you giving up at the game’s easiest success point? If you’re Washington, it means that one quarter of all shots taken against you are worth two points from very close to the rim. That’s not good. 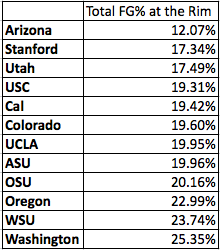 Conversely, Arizona allows just 12.07% of the shots against them to be successfully laid or dunked in. I wish I had national context to these numbers but I don’t have the bandwidth right now. If you want more, email me and we can talk. In bringing things full circle, Jordan Bachynski is going to set both the school and conference blocked shot records. He is a factor in protecting the rim as are all great shot blockers. That’s an important and helpful asset to the game. But like everything else, there is no Bachynski in team. Its appears the defensive collective – if not strategy – can often protect the hallowed area. Of course with this information, we can further our understanding of a team’s defensive strategy which would take a team by team analysis. But that’s for another post so just know that Oregon severely misses Arsalan Kazemi and Tony Woods. NOTE: All data and stats for this piece were obtained from Kenpom.com, hoop-math.com, and basketball-reference.com.